How To Enable Adsense On HTTPS Sites? Do you have a webpage that runs on the secure HTTP protocol (or HTTPS)? Mostly, sites with social networking or eCommerce, or even user-login functionalities, run totally, or partially on the HTTPS protocol. If you run such a website, you would have noticed that it isn't easy to put ads on secure HTTPS pages. And since Google AdSense is (more or less) the standard out there, it needs to be HTTPS-compliant. Previously, AdSense didn't work with this kind of a secure protocol. But Google has just fixed this, and enhanced the ad network so that it can deliver ads to even HTTPS pages. 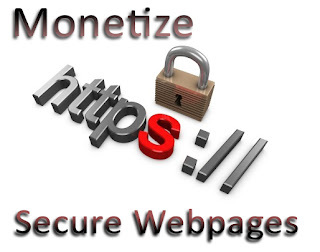 This will allow users to monetize their HTTPS pages as well. Why HTTPS requires a different ad format? The HTTPS is a more secure version of the normal HTTP protocol, ordinarily used for transfer of HtperText data on the web. The 'S' naturally stands for 'secure'. You must have seen this protocol at work on sites like Facebook, YouTube, or eCommerce sites, or even other such sites that require users to login with their credentials. The secure HTTPS provides more security, and protects the users' sensitive data such as passwords, credit card numbers, etc. Due to the more secure nature of the HTTPS protocol, HTTPS enabled sites require all content on the page (even the ads) to be SSL-compliant. SSL stands for Secure Socket Layer, and provides a secure method of communication over the internet. As a result, the AdSense system automatically removes all non-SSL-compliant ads from competing in the auction on these pages. So if you were to convert your current HTTP website to HTTPS, you would instantly lose your earnings drastically. But not if you use the new HTTPS-compliant ads. To use AdSense on HTTPS-enabled sites, all you have to to do is create some new ad units for your site. The old codes are only HTTP-compatible, so you will have to get the new ones. Just create a new ad unit in your AdSense dashboard, and get the new ad code for that unit. Now all that remains is adding that code to the source of your webpages where you want the codes to appear. These ads will work on both HTTP, as well as HTTPS-enabled websites. Note that you don't necessarily have to create a new ad-unit. But you do have to get the new code for your existing units, and ditch the old code, because the old code isn't HTTPS-compliant. That's all! Your ads are now HTTPS-compliant! I was comments many times for approval adsense for website. The problem is i have approved youtube adsense account, but i do not have it for website. I try lots of time but google not accept my request. So what can i do next step please suggest. Thanks to share nice tricks. It will help me much. info yang sangat bagus buat aku pribadi..